We’d love your help. Let us know what’s wrong with this preview of The Romulan Way by Diane Duane. They are a race of warriors, a noble people to whom honor is all. They are cousin to the Vulcan, ally to the Klingon, and Starfleet's most feared and cunning adversary. They are the Romulans, and for eight years, Federation Agent Terise LoBrutto has hidden in their midst. Now the presence of a captured Starfleet officer forces her to make a fateful choice between exposure They are a race of warriors, a noble people to whom honor is all. They are cousin to the Vulcan, ally to the Klingon, and Starfleet's most feared and cunning adversary. They are the Romulans, and for eight years, Federation Agent Terise LoBrutto has hidden in their midst. Now the presence of a captured Starfleet officer forces her to make a fateful choice between exposure and the chance to escape: maintain her cover -- or save the life of Dr. Leonard McCoy? To ask other readers questions about The Romulan Way, please sign up. As "Balance of Terror" is one of my favorite Star Trek episodes, in my youth I followed Diane Duane's collection of novels avidly as they explored who and what the Romulans really were. I do not "agree" with her version of the Romulans (I have my own "private" Star Trek universe with my own take on these Vulcan offshoots; you can see some of it on my blog: http://spocksbro.blogspot.com/). Ms. Duane is, nevertheless, a pretty good author and I like the character of Ael. I'm not so taken with Duane' As "Balance of Terror" is one of my favorite Star Trek episodes, in my youth I followed Diane Duane's collection of novels avidly as they explored who and what the Romulans really were. Definitely not my favorite of the series. The Romulan Way is widely considered one of the best classic Trek novels for good reason. Written before Star Trek: The Next Generation began to form a more solid canon interpretation of the Romulans, the novel gives an insight into the culture and history of a race millennia old, similar to Duane's treatment of the Vulcans in Spock's World . The Romulans are rendered in careful detail as a powerful, passionate, honorable, and highly independent people who are at the same time extremely distrus The Romulan Way is widely considered one of the best classic Trek novels for good reason. Written before Star Trek: The Next Generation began to form a more solid canon interpretation of the Romulans, the novel gives an insight into the culture and history of a race millennia old, similar to Duane's treatment of the Vulcans in Spock's World . The Romulans are rendered in careful detail as a powerful, passionate, honorable, and highly independent people who are at the same time extremely distrustful of outsiders and deeply isolationist. In order to prevent a civil war on Vulcan between the followers of Surak, who prized logic and restraint, and the followers of the Romulan founder S'task, who valued passion and power, the Romulans left to find a new home, and invented their own language and religion along the way. Interwoven with this account of Romulan history is a framing story involving Dr. McCoy's capture and imprisonment for war crimes by the Romulans -- an incident planned by Starfleet in order to send McCoy to investigate a deep-cover Federation spy on ch'Rihan (Romulus) whom they fear has "gone native." We see the current state of the Star Empire -- in a politically fractious place after the events of the preceding novel, My Enemy, My Ally , in which a high-ranking Romulan officer betrays her own people to prevent government-sponsored atrocities -- through the eyes of both McCoy and the spy, Arrhae, who is masquerading as a servant in a Romulan noble house. Arrhae -- born Terise Haleakala-LoBrutto -- still recalls her loyalty to the Federation, but has grown to love the Romulan people and worlds as well, and the tension between these serves to drive much of her story. As usual, Diane Duane is a master of her craft; she writes both humans and aliens with believability and fluidity, in a distinctive, lyrical language. The characters always feel like real people, rather than cardboard cutouts. Her cowriter (and husband) Peter Morwood is as skilled an author; to this day I can't tell who wrote what, which I suppose must be a good thing. This novel, 2nd of 4 of the "Rihannsu" series, encompasses three stories - the struggle of Arrhae, a Federation spy, to immerse herself in the culture and build relationships with the Romulans on one of their home planets, the rescue of Doctor McCoy from the Romulans, and the history of how the Romulans came to be. It's always fun to read another Star Trek novel. I'm kind of a sucker for "honor" stories and aliens with special powers. Diane Duane is a good writer and includes lots of new t This novel, 2nd of 4 of the "Rihannsu" series, encompasses three stories - the struggle of Arrhae, a Federation spy, to immerse herself in the culture and build relationships with the Romulans on one of their home planets, the rescue of Doctor McCoy from the Romulans, and the history of how the Romulans came to be. Diane Duane is a good writer and includes lots of new to me "look up" words such as singlet, chiton, gestalt and viridian. The ancient history of the Vulcans and Rhiannsu (the name the Romulans call themselves) is interspersed between chapters of Arrhae's story. Although I really enjoyed learning about their history, cluture and philosphy, I found this back and forth feature at times distracting. I'm also not a fan of including the difficult Rihannsa names and terminology. I keep trying to pronounce them and get distracted. My favorite part of the book centered on Chapter 10, "The Flowering". It explains why people are the key to civilization and scientific minds are to be treasured. The struggle to get to their new home planets inspire vision and innovation in the Rihannsu. Once they arrive and establish themselves, the elders began to die off and the current generation begins to get complacent. I also found interesting their "religion of things" where things exist and deserve attention. Naming and caretaking matters. It kind of reminds me of the current Konmari way of thinking that is popular now. Either my first or second Star Trek book ever, this is phenomenal. A fantastic book on the origins of an offshoot race (Romulans from the Vulcans), I found the backstory chapters (interspersed with the 'modern time' chapters) far more interesting. Its also when I ran into the difference between "canon" and "non-canon", as well as my first introduction into the mind-bogglingly lame and obnoxious Trekker tendency to worship TV canon (to the point of needing to actively disparage book stories). Tha Either my first or second Star Trek book ever, this is phenomenal. A fantastic book on the origins of an offshoot race (Romulans from the Vulcans), I found the backstory chapters (interspersed with the 'modern time' chapters) far more interesting. Its also when I ran into the difference between "canon" and "non-canon", as well as my first introduction into the mind-bogglingly lame and obnoxious Trekker tendency to worship TV canon (to the point of needing to actively disparage book stories). That, and how trek fandom went off the deep end (see also the hella lame "call us Trekk-ERs" movement; if you're too sensitive to proudly call yourself a Trekkie and reclaim the word from the naysayers, get the F out) is what eventually killed my interest in most things Trek (that and Next Generation). I enjoyed this, but I'm not sure it's going to wear well for re-reads. Every other chapter is a run down on Romulan history, and that could get a bit dry at times. I think it'd also bug people who like to see the series characters interact; McCoy is the only one you see much of. I quite like Duane's original character and the story she and McCoy are in is good, but I'm less enthused about the book as a whole. This is a horribly written book, fan fiction at its worst. There is honestly nothing of merit here, it is a ponderous read, like trying to run with your feet glued inside the trainers AND then glued to the ground. YECHHHH. Do you want to know what's really embarrassing? my copy is signed by the authors. I wonder, could I get a refund as my copy as been scribbled in? P.S. It really is signed, I am not joking. Nice look at the Romulon empire through the eyes of a deep cover spy for the Federation. Makes them come alive and feel like more than token bad guys. Back in the day, when there was only about a half dozen people writing Trek novels, Diane Duane was one of the ones that I'd always buy. You knew you'd get a solid read. I enjoyed the Romulan culture stuff (as usual, Duane should've been asked to write anything in the movies involving the Rihansu), but found the premise of the McCoy plot and the ending to be rather implausible and over the top for my personal taste. But, well, it's Star Trek. Mind-numbingly bad, but a must-read for Star Trek: TOS fans anyway. An unfortunate collision of two things that could have been much better had they been kept apart. On one hand there's a pretty neat history of Romulans. Though rendered noncanon, it's a great work of imagination. I found it to be the more compelling half of the book. The other half is a stilted Heart of Darkness kind of story. Leonard McCoy is sent to exfiltrate a sleeper agent who has been living as a Romulan for years. Of course, she decides to stay. McCoy gets out of harms way with the help of An unfortunate collision of two things that could have been much better had they been kept apart. On one hand there's a pretty neat history of Romulans. Though rendered noncanon, it's a great work of imagination. I found it to be the more compelling half of the book. The other half is a stilted Heart of Darkness kind of story. Leonard McCoy is sent to exfiltrate a sleeper agent who has been living as a Romulan for years. Of course, she decides to stay. McCoy gets out of harms way with the help of a lovely Horta named Naraht. McCoy gets a chance to filibuster his trial. The circumstances of his capture and death sentence on Romulus just kind of exist. They were naturally arranged by Starfleet. It's all kind of jumbled. And since chapters alternate between the two stories, the history, and the present stuff with McCoy, the plot details get kind of lost in the shuffle. Arrhae (the sleeper agent) has a barely noticeable arc. I was never quite sure if she was aware of her status as a sleeper. It could have been a cool little thing, her grappling with her past identity, but it's not really expanded upon. McCoy spends most of his time sitting in a room smug with his plan. I wish it was worthwhile to gripe about why the hell McCoy of all people was chosen for this mission. The reason is because the books won't sell without one or all of the main characters on the cover. It's thoroughly unlikely that McCoy would've gone, even with the contrivance of the Romulans wanting someone from the Enterprise. They'd want anyone from the Federation, really. And they wouldn't kill them, they'd try to extract as much information on the Federation as they could. Definitely wouldn't let them stay in some house for a few weeks. Main storyline: 2 stars. Recounting of the history of the Rihannsu: 4 stars. The main storyline is about a secret agent in deep cover from the Federation at the Romulan home world who for the last two years had stopped sending reports back to the Federation. McCoy gets himself purposefully captured by the Romulans so that he can make contact with her. Storyline was kind of weak and hard to follow at times and the climax was kind of hokey. The descriptions of the history of how the Rihannsu Main storyline: 2 stars. Recounting of the history of the Rihannsu: 4 stars. The descriptions of the history of how the Rihannsu or Romulan people came about as an breakout from the Vulcans and the development of their culture over the centuries was very imaginative and fascinating to read about but did not seem to tie into the main storyline. Almost like two separate books just mashed together. I really wanted to enjoy this book but I was getting kind of bored with the main story as I was not very entertained by what appeared to be a Romulan Jane Austen book mixed with chapters of Romulan history. At least the end got good but I was was fighting to read through this one. It reminded me of the The Final Reflection in its establishing of history of one of the big powers in Star Trek but since these books are not canon it eventually all becomes a moot point with the Next Generation and al I really wanted to enjoy this book but I was getting kind of bored with the main story as I was not very entertained by what appeared to be a Romulan Jane Austen book mixed with chapters of Romulan history. At least the end got good but I was was fighting to read through this one. While the dialogue is a little forced (and completely implausible towards the end for some of the characters), Duane crafted a history of the Romulans that I found more interesting and compelling than the history that actually got used in "canon". This one keeps growing on me over time. Still a favorite after all these years. A good story about the origins of the Romulans. I wonder if anyone's done a similar book on the origins of the Klingons. A much more detailed look at Romulan culture, history and society, reading like an anthropology book in parts. Solid story, though, and very enjoyable. I was quite concerned as I read this particular Star Trek installment that there would be an exam at the end of the book and I felt as though I should have been taking notes throughout! Why is this you ask? While adding some interesting ideas to the Star Trek universe, The Romulan Way felt more like reading a history textbook than a novel. To be fair, the history of the Romulan, or Rihannsu, migration was fairly interesting. However, as I was reading, I couldn't Am I going to be tested on this? Why is this you ask? While adding some interesting ideas to the Star Trek universe, The Romulan Way felt more like reading a history textbook than a novel. To be fair, the history of the Romulan, or Rihannsu, migration was fairly interesting. However, as I was reading, I couldn't help but compare this to "Dune", which had TONNES of history and backstory told in an engaging narrative. Anything that didn't fit into the narrative was put into the appendix. Here we have TONNES of history and backstory interrupting the narrative at every other chapter. Oh dear. The authors should have read Dune before writing this. As for the narrative, it concerned a Federation secret agent writing a detailed ethnography of the Romulan, I mean Rihannsu, people. I'm a sucker for diplomatic intrigue and so found this idea quite cool. That said, here was a great opportunity to tell an engaging story that had TONNES of history, backstory and cultural info contributing to the depth and interest of the narrative. No such luck. Instead, we're (mis)treated to a so-so narrative that is interrupted every other chapter by more textbook info. Oh yeah, forgot to mention - McCoy is in this! Sort of. This was the same problem I had with Pawns and Symbols, that the Enterprise crew takes a distant back seat to whatever other agenda the author has. ~sigh~ Ok, seriously authors, you know that we read Star Trek novels to share the adventures of the Enterprise crew, right? Or at least I do. Oh well, at least we know what the author's agenda was in this case - to provide us with info for the upcoming exam on Romulan, I mean Rihannsu, history. How kind! Overall, this book was an okay read. Okay, but not great. Despite a frusterating narrative structure it did have some some interesting elements. One last question before I end this review, will this be an open book exam or should I have taken notes? The Romulan Way is actually 2, maybe 3, novellas in one. One, this is a fascinating, absolutely astonishing building of the world of the Rhiannsu, the Romulans--why this part of the Vulcan species split off, how their culture, language, customs, religions developed; their journey across many light years to find a planet, 2 planets, to call their own. Duane builds their linguistics, their code of honor, their government and does it in a well-written, detailed historical account. Two, a Starfleet The Romulan Way is actually 2, maybe 3, novellas in one. One, this is a fascinating, absolutely astonishing building of the world of the Rhiannsu, the Romulans--why this part of the Vulcan species split off, how their culture, language, customs, religions developed; their journey across many light years to find a planet, 2 planets, to call their own. Duane builds their linguistics, their code of honor, their government and does it in a well-written, detailed historical account. Two, a Starfleet sociologist has been planted deep within Romulus, playing the role of a housekeeper to an old, respected but impoverished Romulan family and Senator. 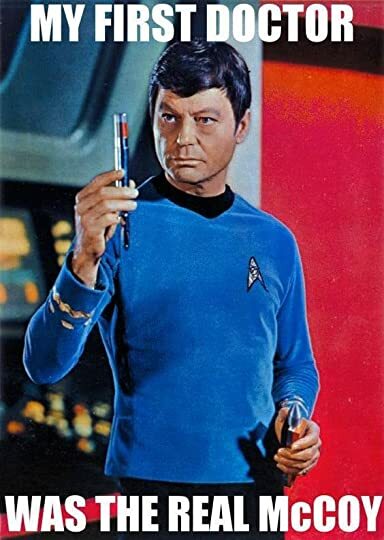 Dr. McCoy from the Enterprise has been sent by Starfleet to check in with and possibly extract Terise, who has not filed a report for 2 years. I almost wish this had been 2 separate books because the interspersing of the "fictional" story with the "historical/world building" was jarring at times. Just as I was getting into the story, the chapter would end and the history would begin again. Finally, in the final chapters, McCoy's story comes to the fore as he, as a prisoner, is taken before the Senate and to his fate. The narrative is engaging and excited; it was nice to see McCoy being resourceful and something of a badass. Commander Ael of "My Enemy, My Ally", the first book in the Rhiannsu series, returns and confronts her people in direct battle. It's an exciting conclusion to this excellent book. 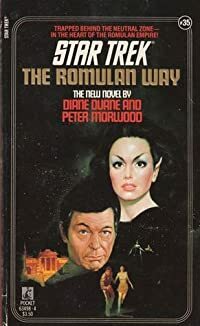 I've said it before but when it comes to the "Romulans" the tv and movie representation (with the exception of TOS) fall way short of the standards set by the work of Diane Duane and Peter Morwood. Their books weave together a people and culture that has a depth and presence which rivals anything created by Star Trek even the Klingons and the Cardassians who were both represented well in DS9. In The Romulan Way we have McCoy taken prisoner by a Romulan commander after the star liner he was on was I've said it before but when it comes to the "Romulans" the tv and movie representation (with the exception of TOS) fall way short of the standards set by the work of Diane Duane and Peter Morwood. Their books weave together a people and culture that has a depth and presence which rivals anything created by Star Trek even the Klingons and the Cardassians who were both represented well in DS9. In The Romulan Way we have McCoy taken prisoner by a Romulan commander after the star liner he was on was "pulled over", being a notorious war criminal (see TOS and My Enemy, My Ally) he is taken to one of the Romulan homeworlds (ch'Rihan) to stand trial and then to be executed. Starfleet Intelligence however are playing their own game, McCoy was the bait to draw out a certain commander and when in place McCoy could make contact with a deep cover agent, gather data on the Imperium and escape assuming all goes well. The novel is wonderful, it really is and I've kept as much of the plot and characters to myself so any first time reader can enjoy the novel as much as I did first time around and continue to do so, it is a very easy book to pick up and read whenever the fancy takes you. While it is standalone you will benefit if you are familiar with the world that Diane and Peter have created, they gave us the Rihannsu (Romulans) and with it a playground which brings out the best in the original series characters. A must read for any Star Trek fan. I found this book very interesting and I enjoyed it. However it is not for everyone. And not every "Star Trek" fan either. Taking place back during the time of the original Enterprise (in the original universe) with Doctor McCoy, it is a deep dive into the history and culture of the Romulans. It starts off in the "present" and draws the reader in and keeps them guessing for a while wondering what is going on. Then it alternates between the present and "history" chapters. While necessary, the his I found this book very interesting and I enjoyed it. However it is not for everyone. And not every "Star Trek" fan either. Taking place back during the time of the original Enterprise (in the original universe) with Doctor McCoy, it is a deep dive into the history and culture of the Romulans. It starts off in the "present" and draws the reader in and keeps them guessing for a while wondering what is going on. Then it alternates between the present and "history" chapters. While necessary, the history sections do feel like a history lesson than a experience. But as I said, without them the reader would be wondering about the choices the characters make. There are some surprise characters, and how McCoy gets away is very unique. It also gives more details with regard to the first contact the Federation has with the Romulans. And this seems to be different than most other accounts. 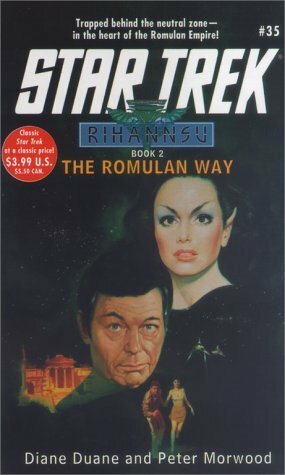 "The Romulan Way" is the second book in Diane Duane's Rihannsu series, following "My Enemy, My Ally". The book is an original piece of Trek lit bacause it's set completely in the Rihannsu homeworld and has only two clear main characters: McCoy and Arrhae; an ORIGINAL character, who's written as well as an apparent Mry-Sue character can be written. Believe me, I abhore Mary-Sue characterization, but you don't even notice it in this particular novel, so cleverly is it hidden among all the cultural "The Romulan Way" is the second book in Diane Duane's Rihannsu series, following "My Enemy, My Ally". The book is an original piece of Trek lit bacause it's set completely in the Rihannsu homeworld and has only two clear main characters: McCoy and Arrhae; an ORIGINAL character, who's written as well as an apparent Mry-Sue character can be written. Believe me, I abhore Mary-Sue characterization, but you don't even notice it in this particular novel, so cleverly is it hidden among all the cultural depiction and political intrique of the story. I must warn all Spock and Kirk fans though, as one of the book's strenghts is that the two usual main characters of the series are not included. It is a rare opportunity to see those extremely overused characters give room to more interesting, even new ones.